After a weekend in which people around the globe wore green, marched in parades, celebrated Irish heritage, and wondered how in the world St. Patrick could have lost to Constance in the first round of Lent Madness 2011, we’re back for another full week of saintly thrills and spills! Believe it or not, we’re halfway through the Round of 32 with eight contests decided and eight more to go. To catch everyone up, on Friday, Ephrem of Nisibis routed Mellitus 70% to 30% to advance to the Saintly Sixteen, where he’ll face John Chrysostom. Today, we’re back to our Biblical saints as Tabitha squares off against Dismas on the plush purple carpet of the Lent Dome. Stay tuned as later today Tim and Scott will release another epic episode of Monday Madness. For the uninitiated, the award-winning* Monday Madness is a production of the Supreme Executive Committee of Lent Madness, featuring high production values and even higher content value. These brief, split screen videos filmed live and (believe it or not) always in a single take, offer color commentary and inside information on issues related to Lent Madness. For the true aficionado of the Saintly Smackdown it is must-see-TV. Actions speak louder than words. At least, they do in the story of Tabitha, also known as Dorcas, recorded in the book of Acts. Few words are spoken in the text, and Tabitha herself never speaks, but we learn about her from her own actions and the actions of others on her behalf. We learn she was always doing good and helping the poor. We learn from the two men who run to Peter to urge him to come at once when Tabitha dies that she is known and loved by the community of believers in Joppa. We learn from the widows who show up—crying and showing Peter the clothing and robes she has made for them—that her ministry provides for some of the most marginalized in society. We learn from the words Peter speaks—“Tabitha, get up!”—how important he believes she and her ministry are both to the community and to the early church. We learn from her response, opening her eyes and sitting up when she sees Peter, how powerful the God she served is. 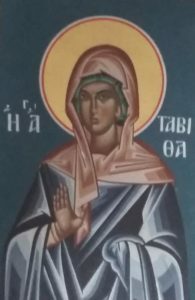 We learn from the fact Peter then presents Tabitha to the disciples—and especially, the text notes, to the widows—how central these women are to Tabitha and to the early church in a patriarchal society in which it was believed women “belonged” to a man and widows were left vulnerable. Tabitha gives us an example of an ordinary believer in the early church and how the work of the people in the pews quietly providing for others’ needs—collecting school supplies and lining pantry shelves and volunteering for service projects—is just as important as the work of those out front, leading the church. Today, Tabitha is celebrated in several Christian traditions, oftentimes alongside two other important women in the early church: Lydia, a successful businesswoman and early convert to The Way, and Phoebe, a leader in the church at Cenchreae who delivered Paul’s letter to the Romans. Their varied ministries show there is more than one way for women to follow Jesus. Most Holy God, whose servant Tabitha you raised from the dead to display your power and confirm your message that your Son is Lord; grant unto us your grace, that aided by her prayers and example, we may be given a new life in your Spirit to do works pleasing in your sight; Through Jesus Christ your Son our Lord; who lives and reigns with you, in the unity of the Holy Spirit, one God, for ever and ever. Amen. Dismas spent his life as a thief—eyeing something until greed overtook him, looking around to see if anyone could catch him, then maneuvering his body at just the right angle for the sleight of hand. Why did Dismas do it? Did he need to steal in order to feed his family? Was he taking bread so that he might provide nourishment for eager and hungry mouths? Or was Dismas consumed with jealousy? He could intuit the value of things and people. So, when Dismas saw the shine of coins or the sparkle of jewels, did he salivate with longing? Did he yearn to possess what belonged to his neighbor? Did he covet what he did not earn? There are only a few things we know for sure about Dismas: He was a thief. He was caught stealing and sentenced to death. At the end of his life, people mocked Dismas as he hung on a tree. The slow torture happened publicly, as a warning to anyone who might consider stealing. It’s hard to understand then why Dismas is included in our saintly line-up. What did he do to gain such recognition? The Roman soldiers crucified Dismas next to two other men—another criminal and Jesus of Nazareth. The other offender mocked Jesus, jeering along with the soldiers and crowds, asking why Jesus wouldn’t save himself. The two men died together. They suffered together, feeling their lashed skin stinging in the dry air. And yet, even among that harsh brutality, Dismas had the hope of paradise. God of grace, we thank you for your forgiveness, even when we deserve punishment. We thank you for the gift of those who suffer with us and for the continued hope that we might someday share joy with them. Through Jesus, we pray. Amen. 177 Comments to "Tabitha vs. Dismas"
Made robes and tunics for widows each week. She heard Jesus, and turned the others chic. Wonderful! I Love your limericks! Clap, clap, clap! Extra credit for getting the name “Dorcas” in there and so very wisely not using it for an end rhyme. Possibly the best one yet. To restore the Hebrew nation. Vote time for Dismas and Tabitha. Dismas’s the thief on the cross. Penitent as his ember dims. Asks Jesus to remember him. Tab tends the widows and poor. Dies in Acts 9; Peter raises her. God’s commitment to her is made sure. Dismas: Don’t be stupid. If a thief, REPENT, and make the Christ your chief! Their tales inspire us today. He shows repentance can’t be late. She states that small works still are great. By now, you know what to do. Halfway through the Round of Three-Two! This is priceless. Thank you. Thank you so much. How long have you been working on these?? Another Michael Wachter Lent Madness hit! These songs just keep getting better and better!! Love them! Where’s the rolling-on-the-floor-laughing-one’s-head-off emoji when you need it? I’ll probably be humming this most of the day. By the way, I voted for Dismas–partly because he was being trounced, and partly because it’s Lent, which is all about repentance and forgiveness. But Tabith/Dorcas is worthy. That’s fabulous!! Mel Brooks would approve!! I can just hear Nathan Lane singing this! Your contributions always make me smile! please every one vote for Dimas, I know he was a theif but he was sorry and Jesus forgave him can you please. My husband and I share voting. He chose Dorcas, but my heart is with Dimas. I can’t believe you made us choose. Serious question: why share voting? Good question. I believe he might be hooked on lent madness. Since he is technically challenged we’re approaching this as a team. It has led to some great discussion. I’m thankful he’s interested and knows more than he thought. I used to work against the death penalty, which included making visits to those on Death Row. Those of us in this movement had a difficult time getting other Christians involved. After all, even though every service is equally worthy, some are more socially acceptable to others. Gathering school supplies and Christmas presents for the poor, especially children, are services to innocent and deserving sufferers. It a little harder is to embrace the guilty who have done great harm to other human beings. They remain one of the last groups of people we feel okay about hating. We can hold on to our desire for vengeance and unleash our anger towards these “monsters”. We call them “inhuman” because that lets us off the hook for forgiving them and sharing God’s Redeeming Love with them. We look at each as the very embodiment of evil on this earth. However, Jesus doesn’t make those distinctions. He sees only brothers and sisters, God’s children whom God loves. His stretched out arms on the cross are ready to embrace anyone who turns to him and asks. I love everything that Tabitha stands for. It is hard not to give her my vote today. But I am going with Dismas because he showed me what it means to be showered with the infinite Grace of God no matter how damaged or damaging we have have been in our lives. He showed me not to be afraid to ask no matter how unworthy we and others proclaim we are. I am with you all the way. Dimas reminds me of all I thank Jesus for. I voted for Dismas, yet felt somewhat guilty about it. So I scrolled through the comments seeking confirmation and found you! Thank you, Mary, for the work you have done for our most vulnerable and for expressing your thoughts so eloquently. I was moved by the courage of Dismas in standing up to those who mocked Jesus. I am encouraged by his belief in goodness and hope in the face of condemnation and death. Agreed, Rian! The first to enter paradise with Jesus gets my vote. The power of forgiveness . . . asked for and given. I’m going with Dismas. Beautiful and persuasive writing by Carol Howard Merritt. I feel uplifted. Dear Sara, Today I went with Tabitha. Although I get the forgiveness part of Dismis and love the chant “Jesus remember me, when you come into your kingdom”, I was swayed by Tabitha’s work with and for the marginalized in her society. I agree. For Dismus there is compassion, forgiveness and grace. I want Jesus to remember me when he comes into his kingdom. As a quilter, I had to vote for Tabitha. It is nice to think that one’s work with the needle will keep someone warm. Although I rejoice at dramatic death time conversions, I honor more lifetimes of diligent service. At age 82 I hope and pray my life since re-birth at age 11, might be a good model, as it is not a story of a dramatic conversion. Tabitha, hands down. A life of service gets my vote every time. Dear LM friends, I was not too worried when I found the Saintly Scorecard was sold out (I could still Kindle it) but then I realized I would miss this year’s trading cards – egad! If someone has an extra to spare, I’d gladly reimburse or trade for 2018 or 2017 scorecard as I have extras. Hope I haven’t flouted any rules, but a nice Lentorium plug never hurts….. If you get an extra one, let me know! I love those trading cards! My booklet didn’t come with trading cards this year! You are not missing trading cards, there are none this year. However the booklets are still nice to have. I have some extras if you want one, email is firstnamelastname at sbcglobal dot net. You are the best – Thanks so much, will do! I am voting for Dismas because he had the courage to ask for something he did not earn or deserve. God calls on all creatures, including humans, to ask. The risk of eternal damnation is so great, it is appropriate to be afraid to ask. Dismas trusted God enough to take the risk. I believe that it was Martin Luther who said, “Sin boldly, but believe more boldly.” I think Dismas holds the record. All honor to Tabitha nonetheless, for diligently providing for the needs of the marginalized. Thanks be to God for both. It was a tough choice. It was a tough choice but I kept thinking that even while suffering an agonizing death, after what quite probably was not an easy life, Dismas challenged the mocking thief in defense of Jesus. And asked only to be remembered – not a place in the Kingdom, no praise or promises, not even gratitude – he asked only to be remembered. I am grateful for Carol Merritt’s touching and lyrical biography. I decided to remember Dismas by casting my vote for him. Thanks so much for the tip on this dissertation. I wish I’d had it when I wrote my study of Acts last year, but it will make good reading now anyway. Tough choice this am. I would have voted for a devoted servant of the marginalized who was raised from the dead because of her importance to the community almost every time. Unless, of course, her challenger was the single person who truly stayed by Jesus’ side in His long day of suffering; who through his own great pain was the only one who spoke up to defend Jesus that day; and who shows us all that it’s never too late to believe, to act, to repent, to be forgiven. Much as I love the story of Dismas and the hope that it offers to all those who run out of time, my vote goes to Tabitha and to quiet faithfulness and compassion; to meeting the need before you with love and grace, and to all the saints, living and departed, who lead lives of ordinary service. Tabitha has my vote because of her work and love for those around her with no thought and probably no knowledge of Jesus. She is an example for all of how a simple act you are able to do can reflect that loving kindness on those who are not thought of as being worthy of love and change the world around you. Isn’t it what Jesus came here for? In my mind she seemed to just live the example with no rewards in her mind, which is the best example we could have to follow. Wait a minute! You’ve been saying “no Tabatha”–which is it?? Go, or no? San Dimas High School football rules! Voted for Tabitha though. This was a hard choice. We don’t know why Dismis did the things he did, but he believed that Jesus was the Messiah. He may have been the “Robinhood” of his time. If she isn’t Tabitha needs to be the patron of prayer shawl ministries. Absolutely! I agree! Tabitha took care of others with fiber arts! She’s my pick for the day! Perhaps those of us who are prayer shawl knitters, could appoint Tabitha our patron saint ourselves! I love the idea! Dismas received the blessing of “knowing” his eternal end. However, a saint he ain’t. This was easy: Tabitha, a woman raised from the dead. I know that in the ancient world hired mourners were common, given money to weep and wail. But a ministry to widows would have been essential and yet easily overlooked. For all the women who blazed the path and walked the way with their own feet, I’m voting for Tabitha. Well said. When Tabitha was in the lessons a few weeks ago, I decided I would vote for her. Today’s blog just reinforced that for me. We’re thinking of adopting two cats soon. If male and female, I think we should name them Tabitha and Dismas! Love Dismas, but Tabitha gets my vote for her work with the poor. I think Dorcas and Dismas would be cuter — just don’t let him steal her food! Yes, you’re right! Dorcas and Dismas it is, if I can persuade my wife, that it. On behalf of CK, a young man currently in prison, who is a friend of a friend, I feel I must vote for Dismas. CK has less than a year left in serving his sentence, which he knew he deserved. He is turning his outlook on life around, and is hoping to help others like himself when released. I pray for him each day, and ask your prayers for him, too. My prison work steered me to Dismas as well. Beautiful blogs today–so moving. Then I read Michael Wachter’s parody du jour and cackled with laughter. Lent Madness at its finest. So for my Dorcas sisters, and for Samantha’s witchly daughter on “Bewitched,” I hereby cast my vote today for Tabitha. I love the brave women of the Bible , Tabitha ‘s life being another example of what women do in humble quiet faith. Brilliant write up for Dismas. I really felt for him – as Jesus clearly did. Still i voted for Tabitha. Because, well , fellow feeling for a woman of a certain age. St. Dismas! The first saint! The patron saint of being in the right place at the right time. Think of how many millions of souls he has counseled and consoled at their times of death. Tabitha. Easiest decision in the history of Lent Madness. A thief who just happens to be crucified next to Jesus Christ and get a last second repreive does not even merit consideration. All of God’s children deserve consideration. Judge not……..
FYI, we posted this on the Lent Madness Facebook page the morning after the shooting: We briefly interrupt Lent Madness to offer our heartfelt prayers for our siblings in New Zealand following the tragic shootings at two mosques in Christchurch. We pray that divisions may cease, that hatred may be driven from our hearts, and that we may be united in love by the God who continually seeks to tear down the walls that divide us. May the Lord have mercy upon the dead, comfort those who grieve, and heal a nation that mourns. Thank you for this (from those of us who are not on Facebook). Voted for Dismas because he ultimately believed, though it was with his (almost) last breath. We concur with the comment from Are ye Able. We also enjoyed immensely Carol Merritt’s writeup of Dismas, how he was a common thief, but in the end was Jesus’ final defender on the cross. I appreciate so much Carol’s stirring write-up of Dismas, but clearly, Tabitha is the true saint. Tabitha is certainly admirable and served an important role, and looks like the shoo-in for this round. But I have to vote for and identify with Dismas. I’m not a thief, but who among us truly feels worthy of forgiveness and of entering the Kingdom? I know I don’t. Yet, Dismas is saved by repentance in his last moments. He is deemed worthy not only of Salvation, but of some of Jesus’ last precious breaths. Powerful stuff for all of us sinners to contemplate. I actually had a grandmother with the name of Keziah! So I must honor that with a yea. Tabitha for sure. Women’s work is so central to the Church’s mission and its survival throughout the centuries, but it’s usually ignored. And she was ministering to the poor and marginalized, which Peter clearly thought was important work! I don’t think Dismas was a thief. I think he was an insurrectionist. If what I’ve learned on the matter is correct, crucifixion was reserved for insurrectionists, escaped slaves, and others who reached beyond their station in life. That’s what Rome thought Jesus was up to as well. And I’ve also heard that the Romans called insurrectionists something like “bandit,” so the word “thief” in the Gospels might be a code for that. Neither here nor there as far as Lent Madness goes, but if this is true, then Dismas is making a very powerful statement by affirming Jesus’ lordship. He’s repenting (turning away) from both Rome and his own vision for overthrowing the Roman colonizers, and affirming the reign of God which had come in Jesus – at precisely the moment when Jesus’ movement seemed most like a failure. Still, I’m going with Tabitha. In memory of my late mother, Tabitha/Dorcas has my vote today. The women’s group at her church was “Dorcas” and she spent one day every week of her life mending and sewing for our local nursing home. She and Tabitha deserve to be remembered today. It came as quite a surprise to find myself going back and forth between Dismas and Tabitha today. I thought Tabitha/Dorcas would be a slam dunk for me. Yet there was this man, hanging on his cross in agony, who looked to Jesus and just knew who Jesus was, why he was there and what that meant. In that eternal moment, hopelessness, repentance of the most real kind, glimpses of Love hanging next to him, led to passionate testimony to the other suffering person whose agony led him to lash out (and we can have no idea what Dismas’ words did in the other crucified man’s deepest being), and a plea for undeserved kindness of the sort God longs to give if we will only receive. There have been times in my life when I utterly despaired of myself – feeling myself a totally, hopeless failure whom God could not possibly tolerate, let alone love. (OK, I get a bit overly dramatic at times.) In those times I could have used these insights into Dismas and into the Love that has nothing to do with what we deserve – only what we most need. I can’t live up to Tabitha, though I admire, respect and honor her. I know many Tabitha’s whose lives of lived love leave me in awe. Dismas is a sign of hope I need when I face those parts of myself that are still seriously ugly. I guess this is why Lent Madness is so popular and challenging. I’d have missed the gift of Dismas without it. Thanks, SEC. I was unable to make a decision until I read your comment, which I found very moving. Dismas it is. Thank you. Although as a widow and seamstress myself, it’s hard for me not to vote for Tabitha, Dismas is such a poster child for the power of last-minute chances and Jesus’ mercy and love. I think it wasn’t just his implied profession of some sort of faith that moved Jesus. It was also that in his own most extreme personal suffering, he showed compassion for another, as he told the other thief to eff off and stop tormenting an innocent man. And he was so modest—all he asked was to be remembered. Dismas for me. VOTE TABITHA!!!!!!!!!!!!!! She came back after peter said to. Peter was part of her life!!!!!!!!!!!!!!!!!!!!!!!!!!!!!!!!!!!!!!!!!!!!!!!!!!!!!!!!!!!!!!!!!!!!!!!!!!!!!!!!!!!!!!!!!!!!!!!!!!!!!!!!!!!!!!!!!!!!!!!!!!!!!!!!!!!!!!!!!!!!!!!!!!!!!!!!!!!!!!!!!!!!!!!!!!!!!!!!!!!!!!!!!!!!!!!!!!!!!!!!!!!!!!!!!!!!!!!!!!!!!!!!!!!!!!!!!!!!!!!!!!!!!!!!!!!!!!!!!!!!!!!!!!!!!!!!!!!!!!!!!!!!!!!!!!!!!!!!!!!!!!!!!!!!!!!!!!!!!!!!!!!!!!!!!!!!!!!!!!!!!!!!!!!!!!!!!!!!!!!!!!!!!!!!!!!!!!!!!!!!!!!!!!!!!!!!!!!!!!!!!!!!!!!!!!!!!!!!!!!!!!!!!!!!!!!!!!!!!!!!!!!!!!!!!!!!!!!!!!! Have always loved the story of Tabitha ( Dorcas). Honor to both, but Tabitha helped marginalized others. Therefore she gets my vote today. A beautiful, beautiful commentary on Dismas . I always loved his shining words during all the bleakness Of the crucifixion gospels. However Tabitha got my vote. Her ministry to women just touched my heart. I think that preaching on Dismas on Good Friday in the manner this commentator did would be a rather refreshing but powerful sermon. A reminder to call on Jesus no matter how low we’ve gone or felt. Btw who the heck wrote this? Beautiful. Most challenging match of all. I rejoice in those who are not idealized and celebrated and whose quietude makes them but grains of sand on a beach. It is those people that give me faith in the goodness of humankind for they are truly one of us. I want to vote for both. Tabitha shows ANYONE can have an important role in the church, but DIMAS… I always liked him. And Jesus promised him Paradise. A lifetime of service to others versus a deathbed conversion? Hmmm. No contest for me. Tabitha-Dorcas gets my vote. I wish these two were not facing each other as I would wish BOTH to advance! Dimas and Tabitha might have been a little thin in the biographical facts department, yet the authors created wonderfully contemplative pieces. A true photo finish for the “coaches” of today’s bracket. Michael, you are an incredibly talented person! Definitely Tabitha for me as she is one of the faithful whose lives are “ordinary, laborious and obscure” (as the Cistercians put it) which is how the 99.9% of us are. Living a quiet life of faith she made a difference in the lives of the people in the community around her. That to me is a real saint; at work sharing her faith probably as she sat with other women working on garments stitch by stitch and just talking. Besides which, our Mother Founder of the Sisterhood of St. John the Divine, Hannah Grier Coome, (who came up in the bracket last week) shares much in common with Tabitha: she had been widowed before she began the Sisterhood, and had been an incredible seamstress and church embroiderer (shout out to all who belong to Church embroidery guilds). There are churches across Canada and some in the States who have liturgical vestments Hannah had embroidered, honing her craft when she was with the Community of St. Mary at Peekskill, NY for her Novitiate training. So I’m all for Tabitha today! Tabitha was a woman of good works and no doubt earned her place in paradise. But I voted for Dismas, because I know of a place called Dismas House in Vermont) which houses those released from prison, and helps them to rejoin the world. I went with Dismas. Picture the sinful one dying along with the Sinless One and both receiving God’s good favor! God is the Great Equalizer! I love it! Dismas’s agonized expiration beside the Saviour is certainly noteworthy on his celestial CV, but my vote is for Dorcas. Her succour to the most marginalized of her day is reason enough. But she also seems to exemplify the spirit of selfless and tireless voluntarism without which places of worship would not be able to conduct their ministries. So here’s to Dorcas, and to all the women and men who toil in the background. Let the one who is without sin……. This matchup reminds me of the parable of the laborers in the vineyard, in which the laborers who worked all day get bent out of shape when those hired in the last hour of the day get the same wages they get. This parable is often hard for some parish old-timers to hear — the same folks who want their church to grow, but get nervous or even apoplectic when the faces in the pews and the customs of the congregation start changing; and seem to think that longevity in the parish should accord people a larger vote in church affairs. I appreciate and respect the Tabithas I have known, faithfully — and diaconally! — serving as needed in often quiet ways. But Dismas reminds us all that God’s grace is grace, wide and generous enough to include us all. The wages of a lifetime of loving service and the wages of sin, repented from, are the same: eternal life and peace and joy in the embrace of divine mercy and Love. Jesus, have mercy on me, a sinner — and Jesus, remember me when you come into your kingdom. Thank you for pointing out the resemblance to that parable! I hadn’t thought of it, but I bet the SEC did. 🙂 It’s so there. And it shows up in the comments saying that Dismas isn’t a true saint or as good as Tabitha because his actions came at the very end of his life. No, that’s the whole point. Your comment identified for me why I chose Dismas better than I articulated it in my own mind myself. Not that I’ll weep when she wins, but he is the one who speaks to me. Dimas is my choice. He is a symbol for me that no one is beyond God’s grace. Truly, grace is freely given in even the worst of us. While I applaud Dorcas’ charity, we are commanded to do such acts. As a fellow stitcher, go Tabitha! It is Dimas for me. “Jesus remember me” is my favorite Taize chant! Not fair making us choose, but the perfect pairing for illustrating that it is never too late to be forgiven, and that leading a righteous life should be seen as a reward unto itself — not the only way to get into heaven. I think Tabitha was not dead but totally exhausted and depleted. When Peter came she opened her eyes and thought that there might be some help for her work even from this clueless male. I am sad more people are not voting for Dismas. He was one of the only few who recognized who this man, being brutally crucified, truly was. He is the first person to explicitly have the assurance of salvation. Jesus himself, in a sense, cast his vote for Dismas. How can I do otherwise? Ultimately, though, I had to go with Tabitha, one of our foremothers in the church. Another tough one for me. Dismas I love for the role he plays in Orthodox liturgies, where we join with him in his wish to be remembered by Christ in the Kingdom of Heaven. On the other hand, Dorcas models for us the life of service we all must embrace to follow Christ. I couldn’t read either story dry-eyed. I voted for Dismas because of the role he plays in my prayer life, but I welcome the coming victory of Dorcas for the help she gives me on the Way. This was tough. I was ready to vote for Tabitha but then I read the story of Dimas. His ability to realize he been wrong in life and to ask Jesus for forgiveness just grabbed me. Will we all be that bold at the end? Isn’t it inspiring and comforting to know that no matter how bad our earthly life, faith an still save us? I’m wondering if the SEC didn’t choose to use the name Tabitha over Dorcas because if she gets into later rounds, it will be easier finding Tabitha kitsch vs. Dorcas kitsch? They could always look for orcas’ kitsch. There would be plenty of that. I’ve always loved the story of Tabitha/Dorcas. It’s inspiring to know that the seemingly small acts of service we do can be appreciated by others to such a degree and, more importantly still, they are viewed favorably by God. I’m thinking that her Aramaic name, Tabitha, is how she was known on her home turf; maybe Dorcas is how she was known as her fame spread into Greek communities. But I’ll bet you’re right–there’s lots of Tabitha kitsch, especially in vintage TV circles! About were actually in heaven with Jesus. When he died and the both died together. But instead asked for forgiveness from a higher court and even defended Jesus with his dying breath. Oh what a choice. Tabitha enchanted me with her caring for others. I thought surely I will choose her. But then I was introduced to the thief. Oh – THAT thief! A thief who truly saw the truth, and reached out for it. In remembrance of Moses the Black, who also repented and turned his life around, I had to select St. Dismas. For Dismus there is compassion, forgiveness and grace. I want Jesus to remember me when he comes into his kingdom. My mother was an extremely talented needlewoman. Among other things, she sewed with a group of women who made beautiful smocked white baby dresses to give to parents whose child had died at or near birth, so the baby had something nice to be buried in. I read the story of Tabitha/Dorcas at my mother’s funeral, so I had to vote for her. I need to remember to read the comments before I vote. Fortunately, either is worthy. I’m inspired by Tabitha’s compassion and her service to others. She gets my vote. And the tough choices just keep on coming! I had not realized who Dismas was, and was truly brought to my knees by the discovery, but I have long been an admirer of Tabitha/Dorcas, so in the end I gave her my vote. This match-up was a difficult one for us! It was a tough choice this time. Both Saints deserve a vote! I know Tabitha will win, but I’m voting for Dismas, because like him, I do not deserve salvation. I hope I too will be in paradise with Christ one day. Isn’t it the Donatist heresy that says we must be perfect for the sacraments to work? The sacraments work without our being perfect. Grace works without our being perfect. Be at peace, sister. You don’t have to be perfect. We do not win our salvation through our desert. For all, all have fallen short. But we are forgiven and perfected in Christ. This was difficult. While Dismas was an example of Christ’s forgiveness and something I work on at times Tabitha has. my heart. “The greatest heist of his life”: I don’t think so. If Dismas’s request of Jesus was one more attempted swindle, what would the point have been? Dismas doesn’t ask to be with Jesus in Paradise; he asks only to be remembered. He may not even be able to conceive of salvation, much less his own. It is Jesus who answers Dismas with so great a gift. Whoever Dismas may or may not have been in history, he is another of the iconic figures with whom scripture presents us, in this case an icon of ourselves. The diversity of Christian and other images of salvation and Paradise attest our inability to compass them. We have devoted much time, energy, ink, and noise to the subject of salvation over these twenty centuries. Perhaps we would do better just to hope and pray to be remembered by Jesus, and to leave it to him to supply what God’s remembrance means for each of us. This is not a difficult choice for me. It’s all well and good to forgive Dismas, who was an eleventh hour penitent, but does that make him Golden Halo material? I think not. Tabitha, on the other hand, spent her life tending to the less fortunate, and, to me, that has Golden Halo candidate written all over it. Tabitha will win, and I won’t be upset by that… but Dismas got my vote. A thief who was crucified for his crimes received assurance from Jesus that he would be with Him in paradise that day — not after centuries in purgatory: that day! This gives me great hope! CPE, summer 1985, Vacaville (CA) Medical Correctional Faciltiy. In the Catholic Chapel, there are two bigger-than-life-size crucifixes. The crucified Christ is rendered in a familiar manner, the other is a more grotesque figure. Placed above the two exit doors, there Jesus and St. Dismas hang. As the inmates left each service, they would be clearly reminded that, while they deserved to be incarcerated, there was still hope for their eternity. Too strong a message for me, but I have never forgotten the sculpture or the men I met there who would consider Dismas their patron saint. Love Tabitha but had to vote for Dismis to honor my brother who chose him for his confirmation name in the Roman church. My parents had to fight with the bishop at that time to allow my brother to choose that name. A group of young people in our parish wished to learn how to sew. . . several experienced and devout women took them under their tutelage and they now do charitable sewing for Children’s Hospital, hospice, VA hospitals, cancer patients, children in transition . . . They are called Common Thread. . . and their ministry continues to grow! Tabitha is an embodiment of the quiet ministry carried out by common believers doing uncommon service! Of COURSE I vote for her, whose life-long service to others through use of her talents, made the Lord’s love known. What a lovely story, mama. May all young people learn to sew under the loving tutelage of experienced seamstresses (and “seamsters,” I should probably add). Perhaps they would be the “Seamsters Union,” had there not already been the International Ladies’ Garment Workers’ Union. Go sisters! Dismas is one of the brood under God’s wing. I voted for Dismas; asking forgiveness when deserving punishment seems more human. Well, folks, it doesn’t look good for Dismas. But he’s one of my favorite heroes in the Bible. His defense of a man he had only heard about, and his plea for mercy, have always touched me very deeply. Please remember that this is the gospel passage I want read at my own funeral. It is proof that no one is beyond redemption. That’s a comfort in any distress. Dismas should have way more votes because he stood up to a bully and did what was right when he didn’t have to do anything. Where is Oliver these days? what a way to honor her. Tabitha/Dorcas has always fascinated me, but today it was Dismas for me – Christ’s mercy for the less-than-perfect continued even on the cross. So hopeful for Tabitha to win since I’m appearing as her for our staff meeting tomorrow. If she loses, rewrites to script are necessary. The first team to shout out either of her names will win an extra point in our Dio of Texas staff competition. At our church we raise money, but material and create clothing to send to children in need. Dresses, shorts with tee shirts have gone to nearby need, and around the world. The project has taken on a life of it’s own. So, I voted for Thabitha/Dorcas and am going to suggest her as a patron saint for our project because she did this work long before us. I first thought my vote would be for Tabitha, however, I have always been against the death penalty which helped influence my vote. However, Dismas who actually was a criminal showed how wide God’s love is when he asked Christ’s forgiveness which I also thought took an absolutely gargantuan amount of courage, and internal fortitude knowing that he, a condemned man was speaking to the Son of God. He also boldly stood up for Christ from the cross calling out to the crowd that had gathered that the Jesus whom they were all jeering at, probably speaking very roughly about among themselves and bullying was indeed the innocent Son of God that many of them had probably even stopped to listen to, and learn from during his ministry. – Yet they all now wanted the same man to be put to death. Innocent, although not in Pilot’s mind, nor the minds of citizens crowding and milling around wanting a glimpse of all the drama going on and engaging in sheeple mindset. A mindset that Pilot had probably also subtly manipulated them all into with which they blindly went along with as well partially due to the power authorities had over them, as well as the power of bandwagon thinking. Dismas’s interaction with Jesus spoke volumes as did the huge amount of courage he exuded to the end although in a phenomenal amount of pain on the cross. What’s more, he was invited to be With Christ in paradise- a reminder that God knows no social ladders, or any divisions when it comes to his inclusiveness, love, and power. What an interesting match-up! The saint who was resurrected to continue her ministry in this life, and the one who became a believer within hours of passing into the next life. I have to go with Tabitha today, though I have always appreciated Dismas’ ultimate example of the laborer hired on to work the vineyard at the 11th hour. My hat’s off to both celebrity bloggers for their sensitive write-ups. Because it’s lent and we have a Taize service at our church, I had to go with Dismas. I never knew the lyrics came from him. If I had not been otherwise occupied on Monday, I would have voted for Dismas, much as I admire Dorcas. The assurance that Jesus gave him, that he would be in paradise with Jesus, is my assurance that I, too, will be lifted up by Jesus’ power to join him at the end of this life. It is his power, and not my own deeds, that makes this possible.